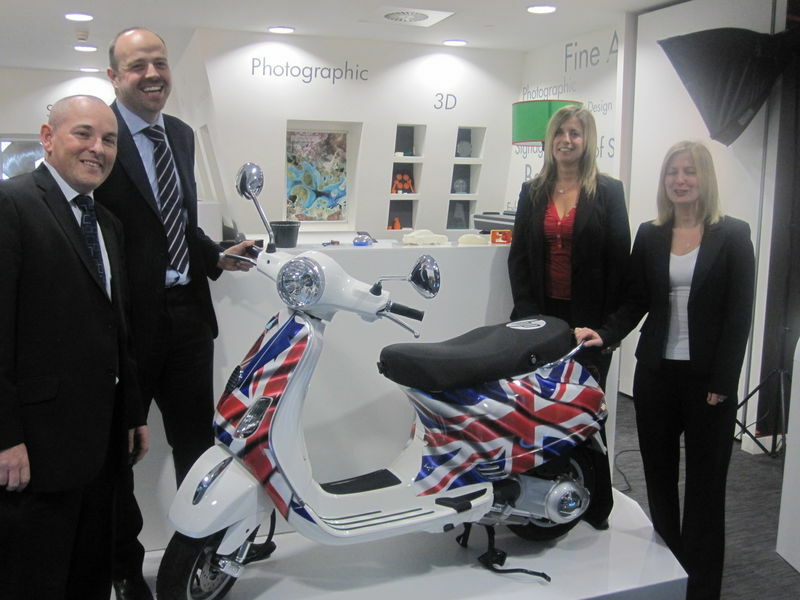 We were delighted to announce the Winner of the 'win a Vespa' competition which we ran to celebrate the launch of the new Designjet Z5200PS printer. The winner, Ms Deborah Winterburn of consulting engineers Clarke Bond, correctly answered the three multiple choice questions, which were centered on the productivity of the new device and was duly presented with her prize on 10th December at HP Headquarters in Bracknell following an independent draw of the correct entrants. Accompanying Ms Winterburn was Lucy King a colleague from Clarke Bond; both were stunned by the graphics on the Vespa which had been printed on the HP LX25500 latex printer, which is capable of producing a varied range of applications including vehicle wraps such as the Union Jack on the Vespa. From left Jason Warner and Matthew Perkins of plot IT presenting the prize to Ms Winterburn and to the right Ms Lucy King.